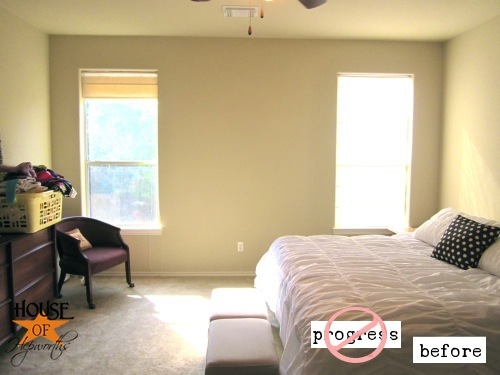 Do you ever go through phases with decorating or crafting or whatever? It’s like I get tunnel vision or something. I’ll get on a DIY tangent, or a crafting tangent, or a decorating tangent. Lately I’ve been on a curtains tangent. And a sprucing-up-the-place tangent. I haven’t done many huge DIY projects or crafting lately. I’ve been focusing on just tying up loose ends and sprucing up the place so it feels more cohesive and livable. 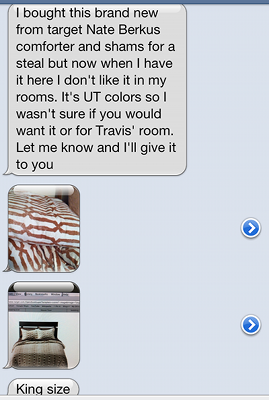 I just blew through a master bedroom tangent, in part thanks to my blogging-turned-in-real-life friend Jenn. Jenn is literally the bomb dot com. She texted me a few weeks ago and said she bought a Nate Berkus king sized comforter and shams and didn’t like how they looked in her room and wanted to know if I wanted them. I’ve been sporting an 11 year old comforter (don’t tell anyone I said that, mmkay?) and in addition to needing a new comforter, this one is Nate-freaking-Berkus so of course I want it. 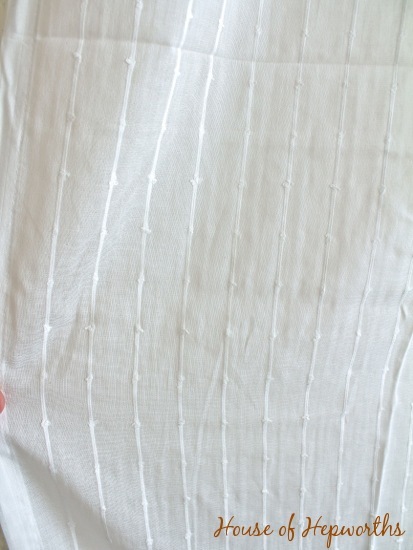 Now, back in 2011 I found a fab white duvet from Target for supeh cheap and I blogged about it. Turns out it didn’t really fit the bed very well, so I didn’t keep it for long, but just in case you have been reading for that long and have the worlds best memory, I thought I’d throw that in. Here was my laughable “after” picture with the new duvet. Yikes. With a double ikes. Seriously. I was going to say my room had seen better days, but unfortunately this was actually an improvement. My poor room is the most neglected in the house. But not anymore! I’m no where near finished at.all. but the bedding did light a fire under me to purchase some sheets that match, grab a few king-sized pillows, and pick up those jumbo shag pillows from the ol’ costco. I also even added some new curtains. So, let’s talk about the curtains for a minute. Why did I wait so long to put up curtains? 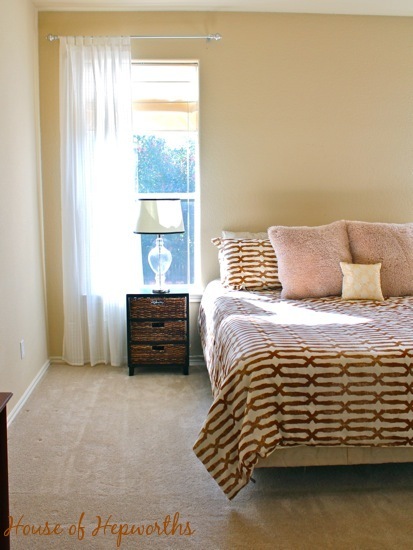 Curtains can be inexpensive and will spruce up a room quicker than anything. I should have done this the day we moved in, not three years later. Eye roll. …and paired them with two sets of my famous (or are they infamous? 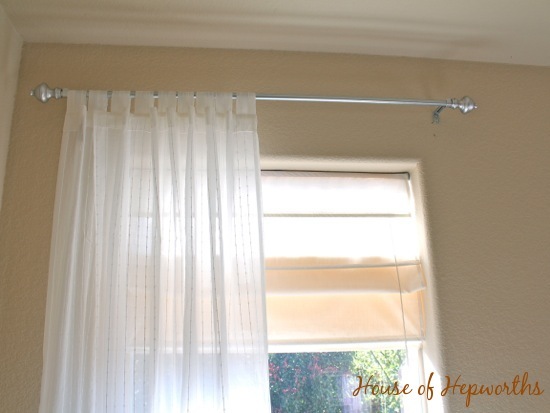 wink) DIY curtain rods that I spray painted silver. All in all? Less than thirty bucks. Wham bam thank you ma’am. And just because I cleaned the heck out of this room and it might be the only time that it will ever be this clean, here’s the rest of the room. It’s coming along. Baby steps, people. See those dressers? I inherited them from my late grandparents who purchased them in the 1950s. Heirloom, baby. Except back in 2002 when I had no clue what I was doing, I stripped and re-stained them. And they look terrible. They are officially on the to-do list. I can’t justify painting some antique solid-wood mid century furniture though so they will be getting stripped and re-stained again. Finally I’m no longer embarrassed to leave my door open when we have company over. And I’m still shocked at how much of a difference some curtains, new bedding, and a better furniture arrangement can make in a room. What’s more fun than an old fashioned before and after comparison? Um, nothing. And on a side note, last weekend I attended the SNAP blog conference where ive been able to read the down comforter guide. 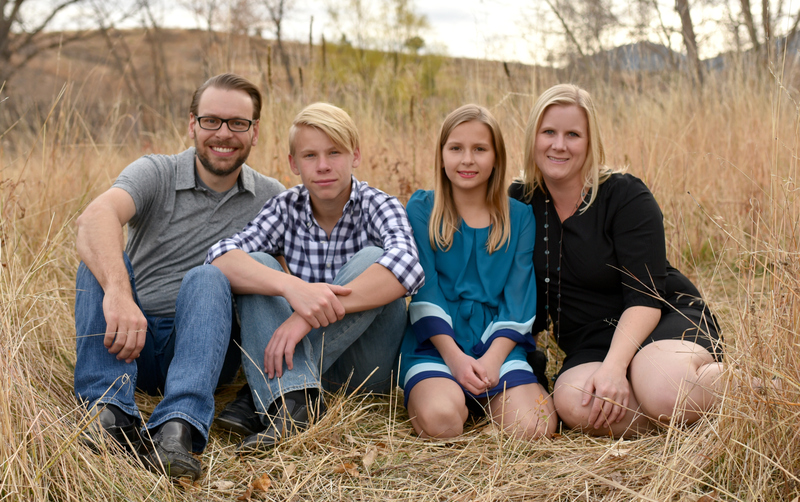 It was so fun, but for all you non-blogger readers out there who really could care less about reading a blog conference recap post, I’m saving you the torture by not posting one. You are welcome. If you really want to see some pictures from my weekend getaway with my blogging friends, where we played way more than we actually learned, you can visit my instagram feed. Love the new bedding…but what I like the most is the new position of the bed between the 2 windows…definitely brings more attention to the bed being on that wall…I for one like your stained furniture…I am having a difficult time with the current trend of painting everything…I bought a new dining room suite with the intent of doing my first chalk paint project…but I’m not sure I can follow through…can’t wait to see how this room progresses! I so agree about the painted furniture. And I really don’t care for the distressed look, it looks dirty to me. I drank some of the Koolaide and did the AS chalk paint on an old dresser. It was pretty fun but I couldn’t give it away fast enough. What’s wrong with wood? But … even as I write this I am eyeing a dining room hutch that is a kinda ugly wood and would paint it if I could decide on a color. A nice clean even complete coat of color. I would like to see how you re-stain the furniture. Your bedroom is just lovely, serene but not boring. I just redid(not sure if that’s a word but it is now!) my master bedroom a week or so ago. We’ve lived in this house for a year and our room was sad! We have new paint, new bedding, stuff on the walls, and removed the sliding closet doors. Maybe I’ll get around to blogging about it next week. I made the trip to Ikea for new curtains this past Sunday. Dark gray for the windows and white for the closet. I saw the nubby white curtains there and wanted them so badly! But the tab top wouldn’t work for our closet. Maybe for our guest room or office someday. I’m glad you have them though, they are so pretty! Love that bedding! It really creates a focal point on the bed, doesn’t it? 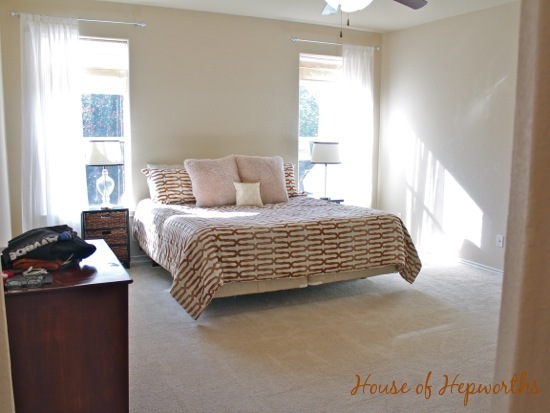 Isn’t it so true that the master bedroom is always the last room to get any love? I swear, ours looks like a rummage sale. Have to ask…where did you get the finials for your famous (yes, famous!) curtain rods. I know in the dining room you used some from ikea. could you share where the ones in your bedroom came from? i have all of my rods up, but they need the finished look of finials and I’m struggling to find some. Thanks! Love the update by the way. I have nothing in my master bedroom, and since I have shutters in my bedroom and livingroom, I don’t need curtains at all, but the spare bedroom have naked windows. no shutters, no curtains, no blinds, nothing. Will have to fix that ASAP because that is where my computer lives… and I spend more time in there more than any other room! 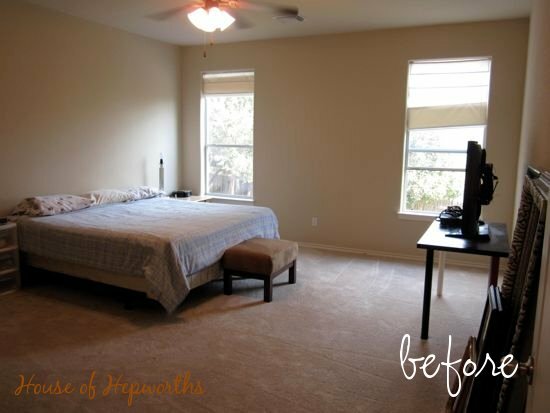 I wish my master bedroom was that clean!! Your room is so peaceful! to blame but myself!!! I am using your bedroom as inspiration! Love this post. 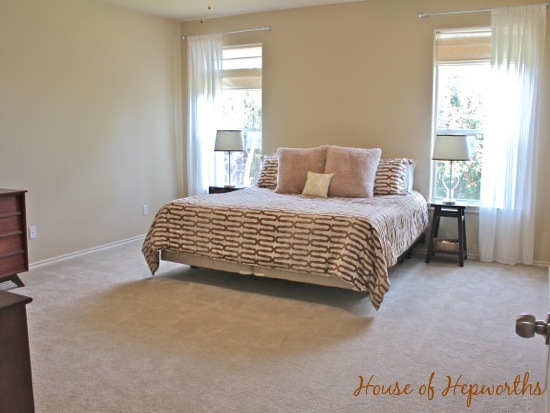 So happy to see you put some time into your master bedroom. 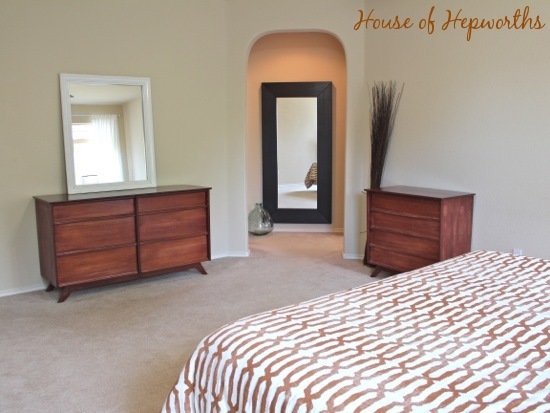 I personally think it should be one of the first rooms completed and just blogged about it. Can’t wait to see the next steps forward. It’s really coming along! 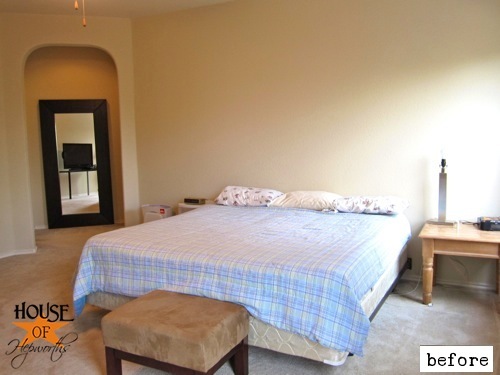 I think you next need a bedskirt / dust ruffle or something to cover up the box springs. Then you can also hide stuff under the bed! If you want to go more modern, you could use a fitted sheet that coordinates with your bedding to cover the box spring, and it would also cover the gap between the pieces (but won’t hide the underbed space). Looks so nice! I saw a great idea to put a fitted sheet over the box spring instead of a bedskirt to finish the look of the bed. It might just finish up the bed. I love the new look!! Beautiful curtains and that furniture . . . WOW! Now I’m telling you that you need to put that “you & me” sign above your bed – DO IT!